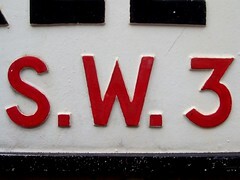 South-West London postal district, north of the River Thames, covering Chelsea and part of Brompton, within the London Borough of Kensington & Chelsea. It crosses the River Thames at Battersea and Albert Bridges. Last edited 2008-07-18 00:34:31 (version 7; diff). List all versions. Page last edited 2008-07-18 00:34:31 (version 7).